The Honda Insight is a car that you could never recommend anyone buy. At nearly AUD$50,000 it's about AUD$30,000 too expensive. It has a poor ride - in fact, its suspension needs quite a deal of sorting - and an amazing lack of interior room. The equipment level is bare bones for this much money, and its acceleration bottom of the class. 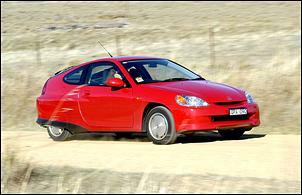 And yet the Insight is one of the most impressive cars that I have ever driven. It's a technological tour de force of almost breathtaking proportions, a car which shows the collective engineering genius of the Honda company in a way never before achieved by any of their other products. The Honda NSX? It didn't do much - if anything - that hadn't been done before. The S2000? Yes, lots of power from a small engine but beyond that, so what? But the Insight is without question the best car in the whole world in at least two aspects. Firstly - and by far the more important - it is the most fuel-efficient car ever produced. And secondly, it has the lowest aerodynamic drag of any production car. 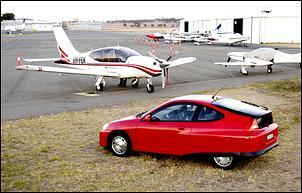 The Insight is a car which must have cost a staggering amount to develop. 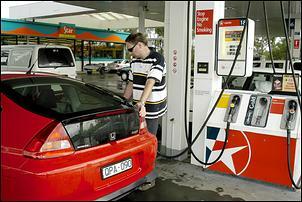 (We'd guess that even at AUD$48,900, Honda isn't making a profit on any it sells.) From its all-aluminium body to its unique 1-litre low friction engine, from its nickel metal hydride battery pack to its combined electric motor/generator/starter, the technology has been developed uniquely for this car. The result is a package that is intriguingly capable in so many areas - and so bad in some others. We drove the Insight well over 4000 kilometres in the fortnight that we had the car - and 3500 of those were done in just four days. Over that distance we came to recognise the inadequacy of the thinly-padded seats, the noticeable lack of features now taken for granted in new cars (there's no seat height adjustment, no lumbar adjust, no steering wheel adjust, no B-pillar seatbelt adjust, no second vanity mirror, no side airbags - the omissions list goes on and on), and the fact that almost certainly Honda's worldwide testing program for the prototypes was quite limited. Otherwise, how would a car be released that has such incredibly bad tyre noise on coarse surfaces, and rear dampers that can be made to fade away on bumpy secondary roads driven at 110 km/h? But we also came to love the brilliance of the aerodynamics (the way that the car would just roll on and on when placed in neutral at 100 km/h), and the sheer intelligent design that has gone into the driveline. 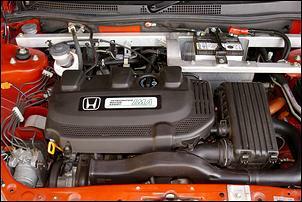 The starting point is a 1-litre, SOHC, 3-cylinder engine. It's a VTEC design (note that the modern incarnation doesn't have a power step in the full-throttle rev range) that has been optimised for this application. In fact, that's a bit misleading: it has been specifically designed and built for a hybrid car. Peak torque of the driveline is at an incredibly low 1500 rpm, while the max power of 56kW is at 5700 rpm. In between there's a delightfully flat torque curve. But - talking about torque - there's also a 10kW electric motor sandwiched between the engine and gearbox. And not just an electric motor, either. It also doubles as a high-speed starter motor and a generator. Put your foot down - especially at low revs - and the torque output of the combination is massively increased by the electric kick. When you thought you had only 70 or so Newton Metres at 1200 rpm (which is still very good for a 1-litre car! ), along comes nearly another 70Nm! Fed in as progressively as you choose to move your right foot, the bottom-end torque makes the Insight surprisingly swift in the cut and thrust of city traffic. On the open road there's still electric assistance, but it's more like a gentle turbo boost. Depending on the level of juice in the battery and how many occupants are in the car, the Insight gets to 100 km/h in about 12 seconds, but because of its torque delivery it usually feels a little faster than this. 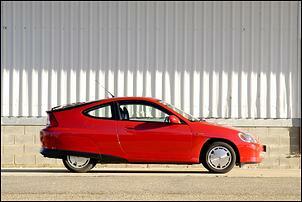 In addition to its low drag and light weight (did we say that the Insight weighs only 827kg?) and hybrid petrol/electric driveline, the Insight has another trick in its book. Come to a halt at a set of traffic lights (or anywhere for that matter), select neutral and pull the clutch out and the engine turns off. But there's no need to panic because as soon as you select a gear, back it springs into life. The high-speed motor/generator/starter can start the car in just 0.15 seconds - and even if it's a bit slower than that, the battery assist will still get you away as the engine is coming alive. So what does all this techno-trickery achieve? In short, unbelievable fuel economy. 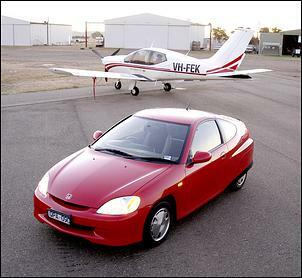 In the 3500-kilometre trip, running two-up with some luggage, always staying at or above the speed limit and passing other traffic at speeds of up to 140 km/h, the Insight turned in a whole-trip average of 3.6 litres/100 km. In the real world, that's so far ahead of anything else (including the hybrid Toyota Prius) that it's not even funny. That's motorbike economy in a car with a CD-tuner, two seats, air-conditioning, twin airbags...suddenly the equipment list doesn't look so skimpy! In normal urban driving, expect similar fuel economy - the long drive included a helluva lot of hills, headwinds, urban traffic in the cities - it was no economy run, that's for sure. But in a road test of a new car the asking price is always the most important criterion. And with fuel so cheap, it's simply impossible to justify the price of the Insight. Honda's other small car - the Jazz - has a vastly lower price, better performance, more room, excellent ride and handling... and costs well under half the Insight. However, not for one moment would we suggest that the Insight is a bad car. In fact many of the technologies seen for the first time integrated into one package will be found piecemeal in cars released over the next decade. And we're sure that Honda will be at the forefront of that field, making use of the invaluable experience of having developed, built and marketed one of the most sophisticated and intriguing cars ever released. Heading out from Mount Tamborine, just inland from the Gold Coast, we wondered what we were getting ourselves into. It was the Thursday afternoon before Easter, and the destination was provisionally Wagga Wagga. At that inland New South Wales town, some 1300 kilometres distant, there was a fly-in of homebuilt aircraft that sounded interesting, but it was a long way and there was no point in pushing it. The revised destination then became Coonabarabran - still a long drive and a potentially interesting destination, what with the Siding Springs optical telescope nearby. But the headlights proved to be excellent - in fact, some of the best I have seen on a Japanese car - and by that night's stop in Glen Innes, I was starting to think that Wagga wouldn't be out of the question, after all. The NVH was poor - in addition to tyre noise there were lots of other noises and vibrations, something I hate in a car - and while the car aerodynamically moved around a little, the steering's slow ratio around centre made corrections a no-twitch affair. In fact by the time we'd reached Sydney and traversed its urban congestion the consumption had risen to 3.7 litres/100km, through Canberra it remained stuck on that figure, dropping then to 3.6 as we drove around Wagga. For the whole trip home the consumption remained obstinately locked on 3.6 litres/100, even when a major crash on the New England Highway forced a massive 350-kilometre detour. 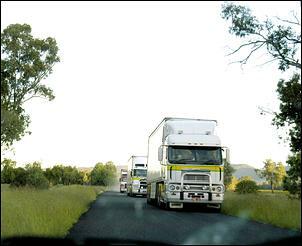 And wasn't that interesting... Off the highway onto narrow bitumen (so narrow that a centre white line wasn't painted), facing convoys of semi-trailers barrelling towards us, all urgently trying to make up time for being forced to take the detour. Dusk was falling, it was perfect kangaroo country, and there were major detours and diversions around bridgeworks. Yep, detours on the detour. Wanting to spend as little time as possible on that stretch of road, I was hiking along, slowing only for the sausages of traffic that were coming the other way. Fuel economy? I didn't give a damn: much of the time I was flat to the floor out of corners, using the gears and revving the sweet engine to its 6000-rpm redline. The Insight is a car that inspires and thrills me. Any engineering idiot can make a car fast - you just put in a big and powerful engine. It's a no-brainer. But to make a car economical while still having adequate performance is just s-o-o-o-o much harder. For me the Insight nearly succeeds. If it rode and handled like a Peugeot 206 GTI, if it had the NVH suppression of a Lexus IS200 (or even of a Prius - the hybrid Toyota is much quieter than the Insight), then I'd be seriously looking at spending some money on one of these amazing cars. Oh no, not a new one... The secondhand prices of the Insight have crashed, reflecting its awkward status. A quieter, better handling Insight at $25,000 secondhand? Yes, I'd be approaching a loans officer. Unlike many - but certainly not all - performance workshops, the guys at Queensland's ChipTorque are genuinely interested in advanced automotive technology... not just how to make cars go faster. And so to say that they were eager to closely inspect the Insight wouldn't be an overstatement. 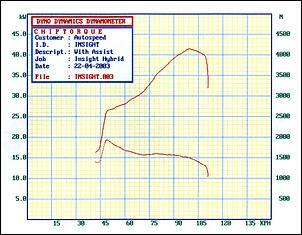 A dyno run with air/fuel ratio and ignition timing analysis? No problem! It was at the end of a long day that there was time to fit the Insight onto the rollers - around 7pm in fact. But first, what about that inspection? Off came the plastic engine cover, followed shortly after by the unscrewing of a spark plug. Already the story was intriguing... perhaps even electrifying? Hmm, we'll come back to that word later... The plug was fascinating because firstly it was coded to a specific cylinder (yep, each plug is indexed on the Insight), and secondly it reached a l-o-n-g way into the combustion chamber. Then there was the lack of exhaust manifold to study (the runners are cast into the head), the battery pack with the huge 'off' switch that was revealed when an inspection plate was undone... hmm a late night but an interesting one. Technician Matthew Spry - on holidays but it's not every day you see the world's most economical car - drove the car on the dyno, while ChipTorque head Lachlan Riddel placed the exhaust analysis probe in the exhaust. Well, actually he didn't. What he found was that when he offered the (earthed through the dyno) probe up to the exhaust, a nice fat spark jumped from the probe to the exhaust pipe. Disconcerting, to say the least. Everyone kept smiling but I - for one - just wanted to get the Insight off the rollers and escape into the night before being saddled with a $400 bill for a very broken dyno hand controller! 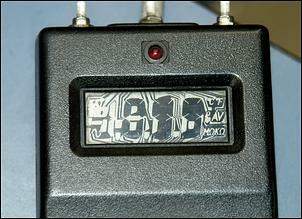 And what if that voltage disappeared into the PC of the dyno and - hmmm! - kinda destroyed the interface cards? After all of that the printout was an anticlimax: in second gear with the battery about half charged the Insight had about 41kW at the wheels - and a wallop of torque at the bottom end courtesy of that electric assist. 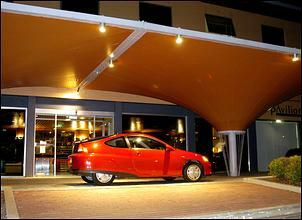 The Honda Insight was provided for this test by Honda Australia. 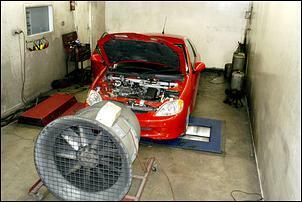 The dyno run was provided courtesy of ChipTorque.